Political Toaster: Why Election 2015 will be the Best and Worst of Canadian Politics. 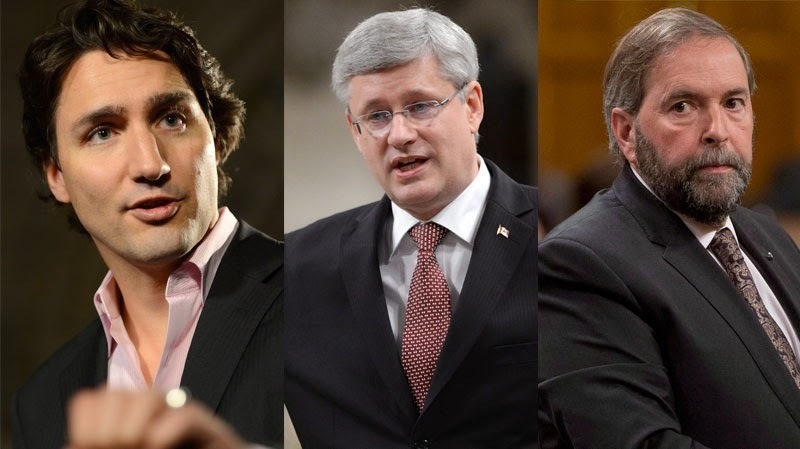 Why Election 2015 will be the Best and Worst of Canadian Politics. With the writ about to be dropped this weekend, it is a good opportunity to look both backward and ahead before heading to the polls after the longest election in Canadian history. Going into the campaign what is clear is that we have a three way race on our hands in Canada. Although the shine has worn off of Justin Trudeau and the Liberals over the last few months, it is too early to count him out. The biggest error he made was to support Bill C-51, which saw an immediate defection of Liberals on the left of the spectrum to the NDP. Yet he appears to be making some very middle of the road, reasonable, and potentially very popular campaign moves, such as the changes to child care and the pledge to increase accountability and change the voting system to be more proportional. The most critical moment for Trudeau will be the debates. He is not known to be particularly gifted in this arena, but if he performs respectably, voters will probably take another look at him. If he performs poorly, it could be end game. He will undoubtedly be the target during the debates, as both Mulcair and Harper will seek to take advantage and get some good soundbites for negative ads out of Trudeau. Thomas Mulcair has another, perhaps greater challenge: convincing Canadians that the NDP can balance the books, and that he is not going to spend the country into oblivion. This will be something that both Trudeau and Harper will focus in on, so the NDP would be wise to come up with a fully costed plan that is verified to add up before the first debate. So far it seems that Mulcair has been somewhat weak and vague on the economic file, and even though he is a strong debater, and is particularly adept at taking Harper to task in the House of Commons, if he can't get the numbers right, people will start looking elsewhere. Stephen Harper has the baggage of almost 10 years of incumbency and all the scandal that comes with it hanging over his head. With the economy looking as if we are headed toward a downturn, the Conservatives will have to do better than just say they are the doing a great job and there is no need to switch gears. The constant stream of attack ads, particularly aimed at Trudeau, are not as effective as they have been in the past, and it is going to be an uphill battle for the Prime Minister to convince Canadians that he deserves yet another kick at the can, even when his "balanced budget" is not as balanced as he claims. But Harper is counting on voters to stick with him because he is a steady hand, and that the other guys cannot be trusted. Will that be enough? It is hard to say. With this campaign being a marathon of 11 weeks, and taxpayers picking up a lot of extra expense, we will get both the benefits and the downfalls of the long march. The benefit of having a longer political engagement is obvious. It gives time for more debates, and more discussion. But it also leads to fatigue, which might play into the hands of the Conservatives, who benefit when people don't show up. However, the longer campaign gives more time for a shift in momentum toward one party or another. This may prove to make the campaign all the more exciting. The first debate will set the tone, and tell the story of the direction of the campaign as well as what the ballot question might be. My expectation is that it will be both about the record of Stephen Harper, and who would be the best choice to turn the economy around. It will undoubtedly be a fascinating campaign to watch.